When you think of Woodburn, what attractions come to mind? Perhaps the Woodburn Premium Outlets, the Wooden Shoe Tulip Festival and maybe even the 35 Mexican restaurants representing cuisine from various regions of Mexico. However, promotion of the town's draws wasn't really a priority for the city until Jamie Johnk was hired as Woodburn's economic development director in early 2016. Johnk was directed to find ways to promote tourism in partnership with the chamber of commerce. At about the same time, in March 2016, the city allocated transient occupancy tax funds to the Woodburn Area Chamber of Commerce to enter into a tourism partnership with Johnk's department, amounting to about $150,000 spread over three years. "This agreement is a fundamental shift in the way we've been thinking about tourism," City Administrator Scott Derickson said at the time. "We're not asking them to go out and do their own thing, we're asking them to partner with the city and help implement the city's plan." And part of that plan has been to get community input through a tourism advisory committee. Last summer, the tourism advisory committee — made up of city staff, the chamber Executive Director Stuart Rodgers, residents, business leaders and even a representative from Travel Salem — met for the first time. "And we had a website up that night," Johnk said. 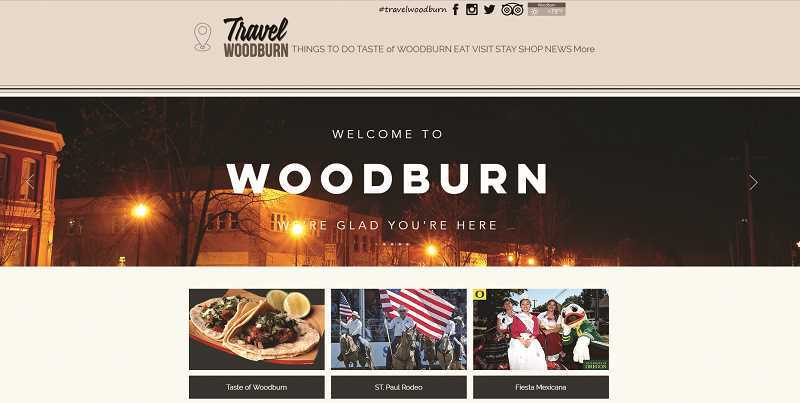 The committee has effectively formed Travel Woodburn, promoting the city through both the website and social media pages. "It's been a great group," Carisa Rangel Gottuso, chairwoman of the committee, said. "I think last year we really accomplished a lot in a short time. We all have different investments in Woodburn, but we're all invested in Woodburn." Part of the committee's job was to devise a branding and marketing plan. And it was through these discussions that Taste of Woodburn was born. "We (city staff) always wanted to do a Taste of Woodburn, but we were challenged by resources and momentum," Johnk said. "Then the committee comes along and is not deterred. They said let's do it. Having worked with so many committees and community groups that just got what needed to be done, for me it's been a lot of fun working with a group that's been this creative and enthusiastic." The first ever Taste of Woodburn event will be June 2 and 3 in the Downtown Plaza, featuring various cuisines served by the many restaurants around town. There will be prizes, entertainment and competitions involving salsa — of both the food and the dance variety. Having representation from Travel Salem, an already-established tourism organization, has helped the group create standards, has helped it keep things professional and has provided quality feedback. But Maricela Guerrero, Travel Salem's destination development manager who has been on the Woodburn committee since last summer, said Woodburn is also successful because of these unique volunteers. "For something like this to be successful, it needs community buy-in," Guerrero said. "There are a lot of assets here. Just the whole cultural piece shows the diversity offered here. I'm committed to continuing to work with them. ... We want Woodburn to be successful. It benefits everyone." In addition to new people being added to the group — Lori Powers, who runs an event planning company, just joined this month — the committee has kept a fresh perspective with members who, until very recently, were outsiders. "I didn't realize Jamie and Stuart were new, but I just moved to Woodburn a year and a half ago and I thought, 'I've got to know about my community,'" Rangel Gottuso said about why she got involved in the committee. "It's been very personal. I've not felt part of a community as much as I have when I moved to Woodburn. Woodburn felt like home immediately. So if I feel this is my home, why wouldn't I want everyone else to come here and see how great it is, to help it grow and see the potential. I'm so excited to be part of that." To learn more about the work of Travel Woodburn or upcoming events like Taste of Woodburn, check out http://www.travelwoodburn.com.